It is always a bit sad leaving Namche. We have so many great friends here. The colourful scene looking down on the town from the Panorama Lodge brings back fond memories of our times spent here on this trip. We met a lot of friends up higher who will have a very eventful next two weeks - this season's Everest climbers. Min and Will Cross were warmly reunited at Base Camp. 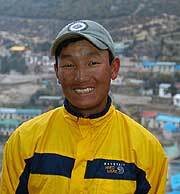 Will looked much stronger and more confident than he did one year ago just before his first Everest summit attempt. We leave the Khumbu bound for Phakding and the River, then Lukla and eventually Kathmandu. Thinking back only a few days and we were at the base of the Khumbu Icefall with the Mt. Everest climbing route looming above us. 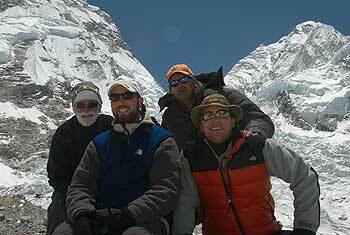 Now Garv, Katherine, Richard and I are sending last e-mails from the Khumbu lodge. I see Wes out on the street - smiling as usual - and taking in the scenes of Namche street life. Dan has already begun hiking and we will meet him for lunch, far below Namche at a trailside lodge where the staff will prepare another great trekking lunch for us. Nima and I will walk behind the group, Toughbook computer and cameras handy to record more sights along the way. I think the word for these final days trekking in the homeland of the Sherpas and the Mount Everest region is "savour". Each day has been special and we have a bit more time to enjoy this wonderful land. Our muscles are toughened, our lungs acclimatized and in many ways these are the best days of the trek.